Radio Ink announced the finalists for the 2018 Radio Wayne Awards. The awards honor the best in radio sales and management. 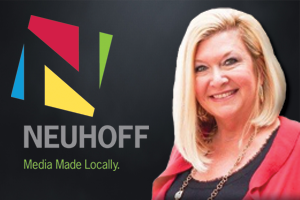 Among the finalists is Neuhoff Media’s VP-Director of Sales and Associate General Manager, Kathy Byerly. Byerly was named a finalist in the DOS or General Sales Manager category. The winners will be announced September 27 at the Radio Show Advertiser Breakfast held during the 2018 Radio Show in Orlando.